This is a common, large, easily recognized tiger moth. It is one of the largest tiger moths in eastern North America. Males are up to 2″ long with a wingspan up to 3½″. Females are much smaller, no more than 1¼″ in length. The thorax is white with twelve bluish-black spots. There is a tympanal hearing organ on each side of the thorax, but this is covered with hairs and is not visible from above. The abdomen is strikingly colored but not visible when the moth is at rest. It is bright orange above with large iridescent blue and black bands in the middle (dorsally) and a row of large iridescent blue and black spots on each side (laterally). The forewings are white with numerous glossy bluish-black spots. The spots are highly variable. They may be solid, boldly outlined with a white center, or narrowly outlined and hollow. The outer portions of the forewing lose their white scales and become translucent as the moth ages. The caterpillar is up to 3″ long and is densely covered with long stiff bristles (setae). The setae are sharply pointed and barbed. They are in clusters rising from prominently raised warts. A narrow, dull red ring between each abdominal segment is visible when the caterpillar moves or curls up into a defensive posture. There is a small breathing hole (spiracle) on both sides of each thoracic segment and all but the last abdominal segment. The spiracles are dull red. Deciduous trees and a wide array of low growing herbaceous and woody plants. Almost mature caterpillars overwinter under logs and beneath bark. The caterpillar hides in leaf litter or under loose bark during the day and comes out at night to feed. When threatened, it will roll up. Adults are active at night. Male adults are attracted to light. Females are not. When threatened, they will curl up, displaying their brightly colored abdomen, and exude a yellow, acrid-smelling liquid. Sources: 21, 24, 29, 30, 71, 75. In 2010 the family Arctiidae (tiger moths and lichen moths) was transferred to the family Erebidae mostly intact but demoted to a subfamily. The former subfamilies are now tribes, the former tribes now subtribes. A usually rigid bristle- or hair-like structure on butterflies and moths used to sense touch. Plural: setae. A small opening on the surface of an insect through which the insect breathes. An external hearing structure. In reptiles and amphibians, the circular, disk-like membrane that covers the ear opening. In insects, the membrane covering the air sac and sensory neurons. Plural: tympani. Share your photo of this insect. Share your video of this insect. I found this moth in my kitchen sink. I leave the front door open so I can hear the cats while they are outside. I guess it flew in. Very pretty. The moth couldn't right himself. I hope he hasn't been in long and got too hungry or thirsty to fly. I'll check on him in the morning. This species has a wingspan of 3 inches (nearly 8 cm). The wings of this moth are bright white with a pattern of neat black blotches, some solid and some hollow. The abdomen is dark blue with orange markings, the male has a narrow yellow line on the sides. Its legs have black and white bands. Adult moths are strictly nocturnal and do not generally fly before nightfall (Fullard & Napoleone 2001). Giant Leopard Moth Beautiful Ultra Macro. Beautiful Giant Leopard Moth Ultra Macro! Look at the black spots on this large white leopard moth. Scientific name is Hypercompe scribonia. Recorded with a Raynox DCR 250 Super Macro lens converter on a Powershot SX40HS. Photographed at Nisswa. Minnesota (01 July 2011). Thank you to 'Shotguneddie' (@Bugguide.net) for confirming the identity of this specimen! Photographed at Nisswa, Minnesota (01 July 2011). 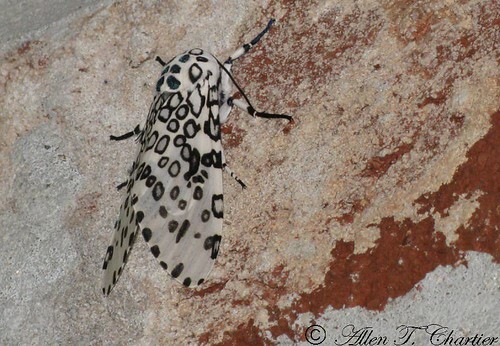 I came across this black and white Giant Leopard Moth in my backyard a few years ago. The orange and black markings on its body are pretty interesting. Report a sighting of this insect.